After much waiting, TUMOR will be available from your local comic book shop this coming Wednesday the 9th. 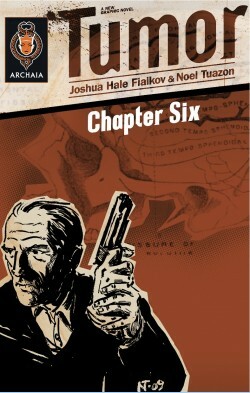 To find your nearest comic shop visit http://comicshoplocator.com/ and ask them for TUMOR from Archaia Comics. if they didn’t already order it, they should be able to order it from Diamond, no problem. If you run a shop in L.A. and would like me to swing by and sign copies, just drop me a line, and I’ll see what to do. If you’re a journo interested in promoting the book, same thing. And please, if you’re a fan of what Noel and I do, let people know about the book and the events. Independent comics rely entirely on word of mouth and recommendations, so, every good word helps. Over the next few weeks, I’ll be slowly disappearing as Christina and I will be welcoming our first child into the world, so, in case I don’t get to say it, thank you all for the support and love the past year. I’ll be heading out to the inaugural Long Beach Comic Con (longbeachcomiccon.com/) this weekend, and I’ve got a few signings, and a couple of panels. Nothing debuting at the show, but, I’ll probably have Punks and assorted other books on hand, so come track me down if you need anything. I’ll most likely be in the general vicinity of the good folk at Archaia for the bulk of the show, so, feel free to stop by. I’m the stocky guy with the awesome shirts. Later this week, I’ll be rolling into Comic-Con to promote Tumor, and I’d love for y’all to stop by. I’ll be at the Archaia Comics booth for most of the weekend, and we’ll be selling a $3 limited edition ashcan of the first chapter of Tumor. They’re hand numbered, and quite handsome.